Back in the summer, at the Pagan Federation London conference, I got chatting to the lovely herbalist Jacqui who makes gorgeous soaps and other health and beauty products for Bewitched Botanicals. The soaps were so lovely to look at – and smelled so amazing too – that I had to buy some for presents for friends. Each soap is swirled with colour, scented with natural oils and sprinkled with sparkles. Earthen love dancing with water, let me be your Undine. You've given me soul, as I danced for you in my aqua veils and diamond beads of water dappled with solar and lunar splendour ...I am Undine. Oh Mighty Smaug! A soap shot through with gold. Just the thing a dragon covets. Scented with Dragonsblood, but not the real thing, because that would be wicked! How to tame your dragon?? Try this luxurious soap for starters! Ghastly grim and ancient raven wandering from the nightly shore. Quoth the raven, 'Nevermore.' Musty old books, smoke and leather heart, a gothic black soap for gothic souls. 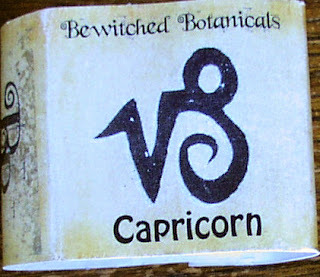 Having bought three soaps to give as gifts, I then realised I wanted one for myself - and Jacqui very kindly gave me a bar of Capricorn to review on my blog. It is a pure, unfragranced goats milk soap - ideal for sensitive skin. The soap is very nice, with a rich lather, seems to last a long while and does seem to have left my skin feeling much nicer than ordinary soap or handwash. The photo to the right only shows the packaging, as I took the soap out as soon as I got home and started using it.